Check out what i just found, i could french this under the A/C controls quite easily i think and maybe still have room for my USB/VM combo... I like that it has all the controls on it, all the other brands ive seen only had a disc select button, or only and eject button. Hey Alex, quoting you here since you seem to be pretty familiar with this car, and I wanted to touch on the second half of your post at this point. So here is the deal, the shop I went to has a pretty decent setup that I'm happy with, but with one caveat; originally they showed me needing a JL Fix86 and upon asking for clarification were saying that they were going to connect it to the high level outputs of the Bose amp and then the new amp to that. Recently, I explained to the rep I'm working with that as far as I understood the Bose variant of the headunit has low-level 4 channel output that goes to the T-harness behind the glove box and then to the Bose amp that we could tap into to get a fairly clean signal (other than the bass roll off) as use that as input to the aftermarket amp and skip the need for the Fix86 entirely. If this is the right diagram, it does seem that the above is true, as you can see the lines for the 4 channels plain and simple. 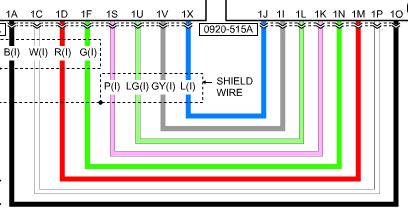 Do you happen to have any references/resources that show exactly what pins on the T-harness connector to tap to get each of these signals? Just so I have a more solid proof of concept to show the shop so they know where to start? Ultimately I'm sure they'll figure it out but want to avoid any extra cost in work hours if I have a reference that will help them find what they need faster. The rep said he would dig deeper into setup on this car after I mentioned the possibility of drawing from the head unit directly, just want to give them a hand if I could since they don't seem to have had experience with this exact car. It is unfortunate that there is the additional confusion in that the Bose audio setup is largely the same for all 3rd gen 6's, but that the headunit changed over from the Tom-Tom after the 14/15 models to the one I have (not sure of the brand) for the 16/17 models, as info for these cars tends to be grouped into the generations but finding stuff about the 14/15 headunit to Bose amp wiring doesn't necessarily help for my car since its the newer head unit. Also, does the head unit handle all the volume control? As in, if my new amp takes directly from the headunit, I won't have issues with losing media controls from the steering wheel or commander knobs will I? Obviously the headunit handles track skipping and the like, but I was worried that the volume controls might go directly to the Bose amp and act more as a gain knob, and then the amp just feeds back digital info to the headunit so that you see the volume change indicator. I'm hoping that its more sensible though and the headunit handles all of that. The last thing to mention is this: While I agree I'd almost rather skip the PAC and just screw RCA ends to the right lines, there is one potential issue I see. The current plan is to replace most of the speakers but leave the stock center channel (since its just there for the silly centerpoint) and rear deck "twiddlers" in (since those are mainly for rear fill) and put coaxials into the rear doors. I'm assuming this would be problematic as if we spliced into the signals directly from the headunit, but still left them connected to the Bose amp, it will act as a voltage divider and screw up the input for both the aftermarket amp and then Bose amp since the Bose amp (and I'm assuming the aftermarket) are expecting the input to be at a certain voltage level. The coaxials we are going to use are convertibles, so I could ask him to use them as a component system and replace the "twiddelers" with the tweeter units if needed. I would very much prefer sourcing from the headunit, as well as as skipping the PAC and just using the wires directly, but I just want to make sure I won't have voltage level issues or data problems like a loss of door chimes, etc. I can tell you the amp I will be using at this point, it will be a JL Vx series, either the 700/5i or the 1000/5i depending on a few decisions that need to be made in regards to the sub, but they both have the same exact connectivity otherwise. Sorry to ask a bunch, but its hard finding info for this exact car since the 6 isn't super popular and there's the 14-17 that all use this Bose system but with two different head units, and then there's the Bose vs non-Bose, etc., so you get a lot of irrelavent info when searching forums or Google. So here is the deal, the shop I went to has a pretty decent setup that I'm happy with, but with one caveat; originally they showed me needing a JL Fix-86 and upon asking for clarification were saying that they were going to connect it to the high level outputs of the Bose amp and then the new amp to that. Recently, I explained to the rep I'm working with that as far as I understood the Bose variant of the headunit has low-level 4 channel output that goes to the T-harness behind the glove box and then to the Bose amp that we could tap into to get a fairly clean signal (other than the bass roll off) as use that as input to the aftermarket amp and skip the need for the Fix86 entirely. So the JL Fix-86 essentially works to actively sum together all the output signals from the Bose amp and rebuild a flat EQ. This rebuilt EQ is then tuned for your vehicle profile and other sound preferences. This is the easiest route for the shop (and why they want to do this) as it ensures that all sounds including chimes and speech/navi announcements are included in the output signal to your aftermarket amps. The shop would also likely do all this tuning for you as to ensure the system sounds correct when they're finished. Frankly the JL Fix86 is a heck of a piece of hardware. The 4 outputs depicted in the diagram would be the x4 pre-amp level signals you need to tap into, except there's other problems here. 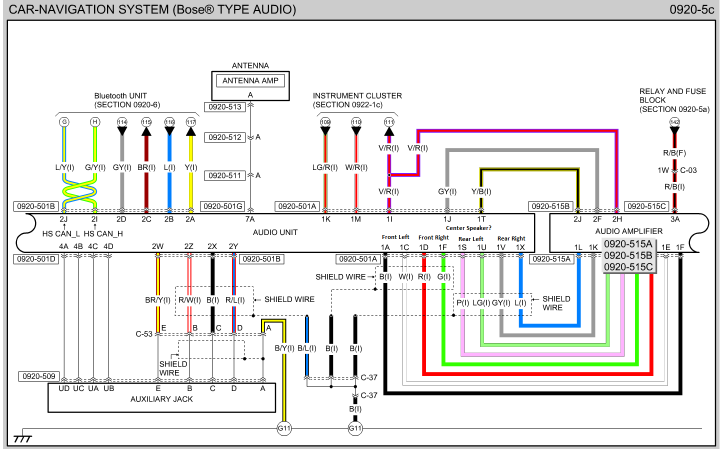 Providing that is in fact the correct diagram for your model year, I'm not exactly sure what the "audio unit" is. This could be the head unit, or a separate module dedicated to mixing all the sound sources for the amplifier, but I'm just not sure. Considering the BT module and aux. input feed into it, it looks to be head unit, however the fact it's labeled "audio unit" is suspicious as it seems like it's referring to an audio-only device which our head units are not (would expect to see media or something). What I can tell is the audio amplifier is a separate module from the audio unit since the numbers there, 0920-515A/B/C, denote the x3 connectors on the Bose amplifier. As far as pinning is concerned, you have the pin numbers and colors there (most of them anyways). What you don't have though is a complete diagram, so you wouldn't easily know where pins 1L, 1K, 1E, 1F, etc. actually are in the connector, nor would you know what's + or -. You could just match by color code, but it's better to have a redundant way to verify what's what. The shop should be able to obtain a more in-depth technical wiring diagram for the vehicle. Considering how Mazda has done audio system design in the past, and how other's have tapped off the pre-amp outputs for sub installs, volume should be controlled by the head unit. Steering wheel controls should not be lost either. The volume knob does not act as a gain knob. It's a digital controller sending signals to the head unit software's audio controller process that handles volume. The pre-amp output gain is what's adjusted for volume (again, historically speaking). The voltage divider/drop when splitting pre-amp level signals is a common misconception. It doesn't work like that. You will loose a tiny bit of voltage in pre-amp signal when splitting it, but it's only because the added device will introduce an extremely minor amount of added resistance. I would be more concerned with speaker timing if you're not using the JL Fix-86 as there could very well be a slight delay between your aftermarket amps output and the Bose amp output. The Fix-86 would compensate for this and make things much easier (unless you're using the Vx-series amps that have the DSP built-in and you could modify the timing there). Alright, so hold up here a minute... I basically I wrote out all these replies and then I realized the amp's you're considering. So I ask this: Why in the world is the shop recommending the Fix-86 DSP in conjunction with the Vx-series amps that also have a DSP built in??? 1. Providing you can confirm chimes, PDC tones (if you have it), and speech announcements all come through the pre-amp signals from the head unit, then use the JL Vx-Series amp. These will have a DSP too and you can adjust for timing and tuning to your liking, just like the Fix-86 would do. 2. If you don't get the extra sounds through the pre-amp signals from the head unit, use the Fix-86 but save yourself the few hundred $$$ and just get a XD700/5v2 or XD1000/5v2. It makes no sense having a dedicated DSP and a DSP amp at the same time. Last edited by MZ6Alex; 04-16-2019 at 12:50 PM. the remaining stock speaker timing since you're right and there will most definitely be a latency issue, even if it's not perceptible. As for the whole thing with the Fix86. I agree that this confused me as well and seemed unnecessary. I personally requested an amp with DSP because I wanted to make sure I could combat any of the nonsense the headunit performs, as well ensuring I had the ability to fine tune the overall sound of the system to my taste as much as possible. It was presented to me as that yes, while the VX amps have processing, they are more geared towards minor configuration corrections (such as timing), but largely have DSP features that are for tuning the systems sound from a subjective stance. On the other hand, the Fix86 was portrayed as having more features that are targeted at getting a flat input/output frequency response curve when connected go a stock system and sourcing from a point after the processing of the stock system (in this case post bose amp). So I dont know if it is that the VX amp DSPs dont quite have all of the features needed to get a clean signal after the Bose amp (like the summing and balancing that would be required), or that the wanted it to be so that when I was tweaking the setup on the VX amp I was assured to be starting out with a clean signal and flat curve, so that I didnt have to make adjustments while constantly keeping in mind that the defaults were no longer the actual defaults but that if I wanted to reset what I personally tweaked and that I needed to remember to always reproduce certain exact tunings to compensate for being post bose amp. If it's the latter, that does make some sense to me, although it would be annoying to still spend the extra money. If the VX amps have a feature that's equivalent to taring a scale (i.e. making the neccessary adjustments to cancel out the Bose amp processing and then saving that as the "baseline" so that any future tweaking is presented to as if everything is flat an unaltered while behind the scenes it adds my additional flavor based tweaks on top of the more objective ones done previously) then the Fix86 should be entirely unnecessary, unless again, it is missing a form of processing or two that would be needed to go post Bose amp like perhaps a summing function. I did not compare all of the exact DSP features of each so I will admit I'm not sure. Either way I would like to take the car in and confirm they can tap directly off the headunit and then see about any extra sounds like the chimes. If it all works out then I 100% wouldnt needthe Fix86 and would be working with an overall cleaner signal anyway. So regardless of the potential issues related to auxiliary sounds (chimes, etc. ), you're confident that the headunit directly puts out a full range, low-level signal that at least carries the music being played through the various headunit sources? If it is true that a few of the cables coming out of the headunit that go to the T harness in the glovebox carry a regular low level signal, I can test to ensure that all system noises go through the headunit myself as I have a scope. Would just need to drag it with an extension cord into my car, remove the glove box and then start probing each pin until I find the correct ones. Just wanted to add that I have found a post here or there of people mentioning they tapped a signal for the rear door speakers (since they are supposed to be full range) but somehow PRE Bose amp. 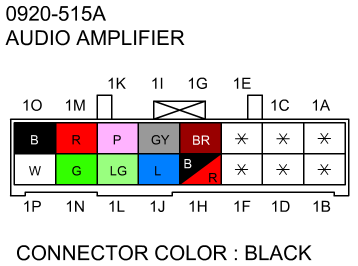 In most of these schematics the only clear labeling on which line belongs to which channel is at the outputs for the Bose amp and most of the input wires are not labeled aside from their color. Again, ultimately I will probably need to poke around myself to see if I can find a line between the headunit and amp that is clearly left/right out (whether it is front/rear or even before that split), but was hoping I'd have a sense of which wire it should be so I'm not going in totally blind. He noted using the (as I complained earlier, unlabeled) grey and blue wires between the TAU and amp. I'm not sure if that gives access to a straight up stereo signal before any kind of front/back channel generation has occurred as those wires are referenced to common ground. Or if it is 4 channel lo level and he just grabbed the positive and negative for one of the channels since he was only adding a sub. I posted in the thread to inquire more so maybe I'll get lucky and he will see it. EDIT: It seems to be that the headunit definitely generates a 4 channel output so its just a matter of figuring out which wire pairs belong to which channel. If I had a pac to disassemble I could figure it out that way, but I'm not going to buy one (unless I want to make use of its connectors so I dont have to splice directly into the stock cables) when it has become clear the best way to do it is to just add RCA ends to the right wires, and like you said actually using the PAC box would lower the already low-level signals even more. So, looking over the 2014 workshop manual a bit more I believe I may have it figured out. I may actually buy the PAC just to use its cables to make a "middle-man" cable that I can use to monitor each line while it is still plugged in (and ultimately tie RCA jacks onto if this works out) so I can test out this theory. Everything within the scope of my findings also applies to the 2015/16 since the connections between the TAU and Bose amp appear to be the same on all three. The page is named "CAR-NAVIGATION SYSTEM (Bose TYPE AUDIO)". This is further supported by the fact that these wires are shielded, while many of the other wires connecting to the TAU or Bose amp that are clearly labeled as something data related, are not. Now I have no idea which of each pair is the positive or negative, and no clue of all the channels which ones are front left, front right, rear left, and rear right, but I am fairly confident these are the wires I want to tap into right here. I believe my scope has a capture function so I can always load an output sample into MATLAB, amplify it, and play it to confirm I got the right wires as I should literally hear whatever source material I was playing at the time Also, I can do this to help figure out which of the wires are positive (although it shouldn't matter as long as they are all hooked up in phase). Figuring out the channels would just be a matter of disconnecting only one set at a time and listening to which portion of the car has the audio drop out. Now, if you look at the rest of the connections going into the Bose Amp there are the speakers and then a number of data lines; however, most of the data seems to be unrelated to Audio so I am assuming that Mazda just used the Bose AMP as a junction box for other electronics in the car (for example the push start button is fed through the AMP <img src="http://forum.mazda6club.com/images/Mazda6Club_2014/smilies/tango_face_smile_big.png" border="0" alt="" title="Laugh" class="inlineimg" />). So, I think there is a good chance that everything audio related goes through those four channels and that I won't lose anything by splicing in at that point. Either way, I can easily test if anything like chimes or the like are sent to the amp from elsewhere by monitoring the 4 channels while causing those sounds to play, or even disconnecting those 4 channel lines and seeing if I can get any sound to be produced at all (since if it did then the amp would be getting that sound from somewhere other than these 8 wires). At some point I am going to sniff these wires by accessing the cable at the amp side under the seat and I'll see what I can figure out.